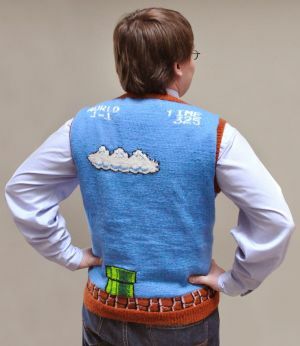 This seventies-like nerd has received the perfect gift to celebrate his passion for video games: the Super Mario sweater vest. Knitting stitches are basically pixels, right? 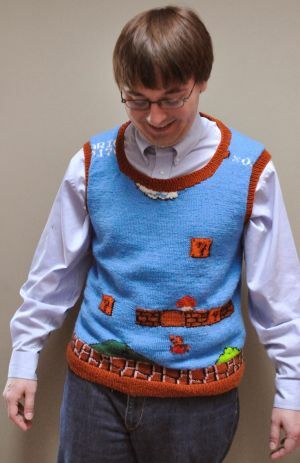 I took that idea to the extreme, and converted a screenshot of Level 1-1 from the original NES Mario Bros. game into a ginormous knitting chart made up of over 10 sheets of tabloid paper taped together, which I used to make a sweater vest for my video game-loving husband. How do I get one¿?